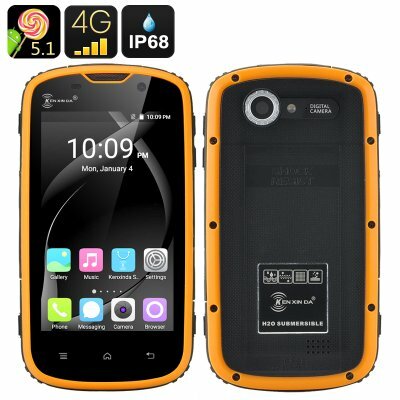 Successfully Added HK Warehouse Ken Xin Da Rugged Smartphone - IP68, Shock Proof, 4 Inch Touch Screen, Android 5.1, 4G, Dual SIM (Yellow) to your Shopping Cart. The Ken Xin Da W5 has a quad core CPU and 1GB powering it, when this is combined with the Android 5.1 operating system you get a proficient performance that is able to multitask, run games and play music so you won't lack any Smartphone functionality. the 4 Inch display help keep palm size phone small and compact so it won't weigh you down on your outdoor travels and can easily be used in one hand, great for snapping pics of your nail biting adventures With its 2800mAh batter the W5 rugged phone won't let you down as it can remain in standby for up to 150 hours or be used for about 6 hours of talk time between charges. The W5 Smartphone can withstand submersion in water and is impenetrable by dust particles thanks to an IP68 protection rating. With a strong case brining shock proofing this robust rugged phone has triple protection from all that it will face in the great outdoors. Perhaps the most affordable rugged Smartphone around the Ken Xin Da W5 brings all the protection you need in a compact package that makes a great option for every outdoors enthusiast. The Ken Xin Da W5 Rugged Smartphone comes with a 12 months warranty and is brought to you by the leader in electronic devices as well as wholesale rugged smartphones..